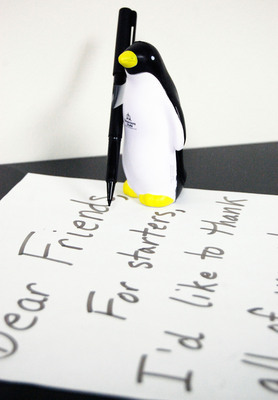 Pierre the Penguin, an unofficial Governors State University mascot, posed with pen and letter. For starters, I'd like to thank all of you who brought me along on your vacation trips this summer. Once again, I got to travel near and far, and see the marvels of the wide world unfold before me. Quite an honor for any penguin. Some of you may have been wondering about the ultimate outcome of this year's Take Pierre on Vacation Contest, sponsored by GSU View. I can assure you that my colleagues at GSU View have not forgotten about the contest, or the fabulous prizes that were promised throughout the summer. They are good folks - especially for non-flippered bi-peds - and have given their assurances that the contest will be concluded by the Monday after Thanksgiving, and prizes will be distributed by month's end. So stay tuned. Thanks for your patience and best wishes for the holiday season ahead. The photo and text of the letter were featured in the article “A Message from Pierre” on p. 2 of the November 12, 2012 GSU View as part of a Take Pierre on Vacation contest.